Here is another ideal pair for Valentine’s Day especially for those who like bows – Valentino Couture Half d’Orsay. Cute and elegant at the same time. But, when you see words like “Valentino” & “couture” ya know they don’t come cheap. Yours for $695. 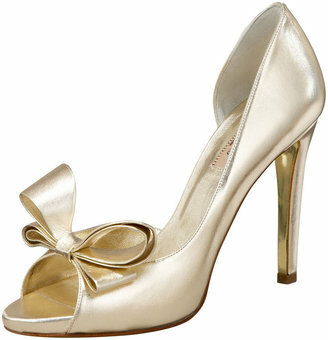 Get the most bang for your buck with Senorita Peep Toe Pumps by Paris Hilton. Pick your favorite color for $89 – black, gold, silver, pink, green. Mine is this soft gold. These look great with both jeans & dresses.